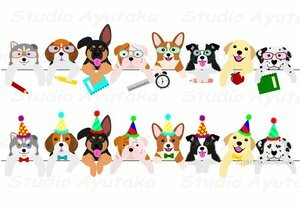 かわいい子犬のボーダーセット。子猫、子犬＆子猫のもございます！/Kitties, kitties&pups are also available! Japanese nengajo with 2019 zodiac animal wild boar. Background for next new year card. In Japan, next year’s zodiac animal is the wild boar, but in China it is the pig!